India is a warm country as most of the time sun shines so brightly in some parts. Although some Indian parts are always clouded by winter or some by rain, every weather has its own problems and we try to escape from them by utilizing the preventive cautions. Seasonal driving is always experimenting and requires additional care as well. 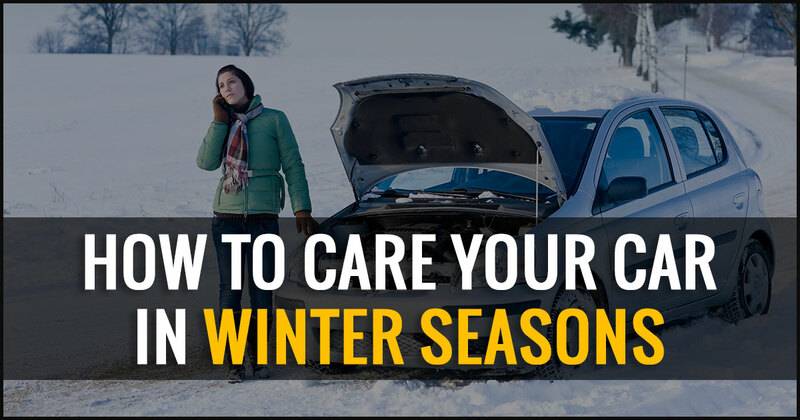 Here are the 8 amazing tips to rescue your car and encounter problems that come around during winters. There are many people who have confusion between winter, snow and all-purpose tires and this is the reason they misunderstood aspects of winter car care tips. Most of the users confuse winter tires with snow tires. They just associate the snow and winter tire with the perception that if their region accumulates ice and generally wet, then only they need extra care and replacement of tires. But the fact is, winter tire is designed with rubber compound which is effective in gripping not only in snow but also at the cold pavement, the winter tire improves braking with whooping 40% as the mercury downs to freezing. So if you are going to replace the tire, then choose a perfect pair as your safety depends on tire traction. During winters, thick oil becomes denser and creates the problem in the functioning of the engine. So it is necessary to switch to thinner engine oil during winters in order to extend the life of your car during winter months. The manual provided with the car always suggest a range of acceptable oil viscosities depending upon the climate you reside, and it needs your attention in proper check before the temperature goes down. If you are late in changing your latest oil check, then the first snow coming can kick you out and make you not to ride through the winter season with dense lubricants attributing exhausted extra packs. Windshield wipers play a very important role as a washer fluid because they maintain forward visibility during the cold season. The altering season is the perfect indication to replace your wipers on your car if you see they couldn’t sustain this winter and couldn’t wipe out snow for four to five months more. Find out the rubber on the windshield that it is properly attached to windshield glass or not, as this issue is going to be critical during winter with increased precipitation. Battery check is necessary during winter time as cold works more effectively on battery. To analyze the functionality of battery, do a volt test on the battery to ensure it can take you through the winters. Not paying heed to battery functionality can adhere you somewhere in winter with a not operating car. Coolant makes your engine to keep away from freezing and further essential for the engine during winters. Always check your coolant level as it must be high to ensure that they are not draining from any leaks. Winter days are shorter as compared to nights and sometimes fog is so high that roads are not visible which means you have to spend more of time in the dark. Check your headlights that they are in the best shape and working properly. If they are not working, try by replacing the bulbs. During winters, wiping out fog and snow from the lights everytime you drive is also important. Checking defroster and climate control system is also important as these play important role in making your climate level controlled. The climate control system keeps your surrounding warm and the defroster is useful in making your windows fog-free and ice-free. In winters, just keep the engine in idle mode for about one minute. Do not put in rev mode as oil takes the proper time to arrive at the moving parts. Revving the engine obviously increase the wear rates and waste fuel as well. During sub-zero temperatures, before starting the starter motor, leave the ignition on for 5-10 seconds. This practice will save the battery from performing extra stress on these tasks. Following these tips during winter not only ensure your vehicle to perform well but also help in saving your time and life as well.